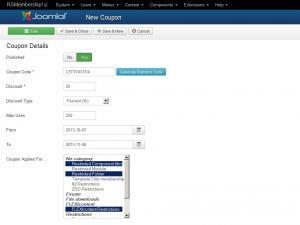 The newly introduced Coupons offers the possibility to create multiple coupon codes for memberships. Until RSMembership! revision 16, you could create a single coupon for one membership. 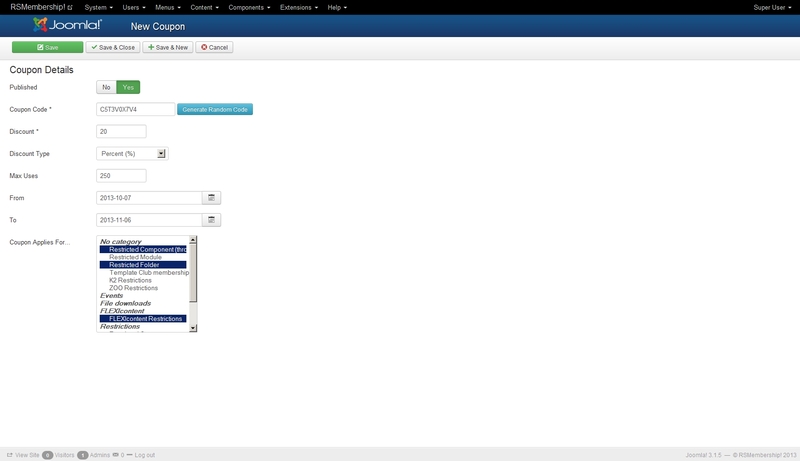 The new coupon configuration area can be accessed from the Components >> RSMembership! >> Coupons area. Published: Publish / unpublish the coupon. Discount Type -	Percent / Fixed Value: If percent is used, the discount will be applied as percentage from the membership price. Max Uses: how many times a coupon code can be used. If left blank or 0, the code can be used for a unlimited number of times. The coupon codes are applied only to the membership's price, not extra options, upgrades or renewals.